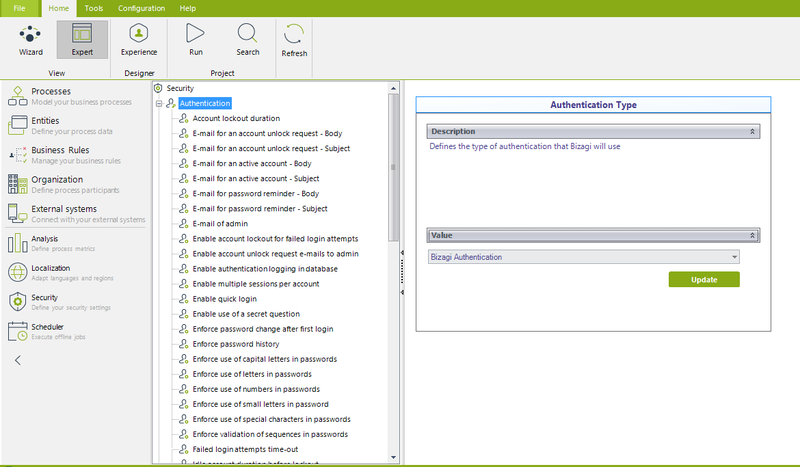 Bizagi Authentication is the authentication type set by default in Bizagi projects. When using Bizagi Authentication, stored passwords use a SHA-256 hashing algorithm. This duration must be greater or equal than Failed login attempts time-out. Defines whether Bizagi uses Persistent o Session cookies. The idle session time-out defines the expiration time for cookies. Defines the body of the mail to be sent to the administrator when a user requests the unlocking of an account (i.e when using Enable account unlock request e-mails to admin and specifying E-mail of admin). Defines the subject of the mail to be sent to the administrator when a user requests the unlocking of an account (i.e when using Enable account unlock request e-mails to admin and specifying E-mail of admin). Defines the body of the mail to be sent to a user when his/her account is created and set as active. Defines the subject of the mail to be sent to a user when his/her account is created and set as active. Defines the subject of the mail to be sent when the user requests a password reminder. Defines the e-mail of the administrator of accounts in charge of receiving E-mail for an account unlock request (i.e when using Enable account unlock request e-mails to admin). Establishes if accounts should be locked out when a maximum number of failed login attempts is reached (to use with Maximum number of failed login attempts). Establishes if e-mails are sent when a user requests an account unlock. Establishes if an audit log is recorded with all authentication events. If enabled look for the table AUTHOLOG in the database. •Using Quick login feature does not create records in the authentication log. •Even when this option is disabled, failed authentication attempts are logged. This happens so that failed attempts can be counted and validate if the account should be blocked after a certain amount of failed attempts. Establishes if login to the Work portal is done without inputting the passwords of accounts (a quick login through a drop-down list displaying valid login accounts). The drop-down list will show the first 100 active users (from the 101th user, accounts need to be typed into a text field). When using quick login, the work portal's authentication log query feature will not record login events. As soon as you enable it, you need to make sure to run an iisreset command on your prompt, for the quick login to work seamlessly. Establishes if more than one simultaneous session is allowed for a same account. When this option is enabled, cookies will be treated as session cookies. Establishes if the project uses multiple factor authentication. Establishes if a secret question and answer can be filled out by users, in order to have the possibility of avoiding an account lockout when the password is forgotten. Establishes if a user must change the password after the first login. Establishes if passwords must contain at least one capital letter. Establishes if passwords must contain at least one letter. Establishes if passwords must contain at least one number. Establishes if passwords must contain at least one small letter. Establishes if passwords must contain at least one special character (i.e non alphanumeric characters). Establishes if passwords are not allowed to contain character sequences (e.g: abc or 12). Defines the number of minutes in which failed login attempts time-out. Defines the time in minutes in which an idle session expires; in which case it would be required to authenticate again. This setting defines the expiration time for cookies. Defines the maximum number of days in which a password can be used, before it requires to be changed (i.e, the expiration time of passwords). Defines the minimum number of days in which a password must be used, before it is available for a change. Bizagi has a password restriction as an extra security measure: the user's password should not contain portions from their username. When setting passwords from the WorkPortal's user menu, Bizagi ignores all password policies.